Allston Pads, the largest source of real time apartment listings in Allston MA, has published an average rent price infographic in conjunction with Boston Pads to help renters and landlords alike in accessing the most up to date rental data for Allston. The apartment price and real time vacancy rate data was pulled from the immense Boston Pads database, which contains over 156,000 Greater Boston apartments, 500,000 apartment photos, 11,000 apartment videos, and more than 16,000 local Boston landlord contacts. These average prices were formulated from 678 local Allston apartments that have either been rented in the last 12 months or are currently available. The realtime vacancy rate was calculated by taking the sum of the total number of currently available apartments and apartments that will become available in the upcoming months, and dividing it by the total number of apartments in the database for that area. Population and median household income data was pulled from the US Census Bureau. Average rent prices in Allston are very similar to the neighboring town of Brighton. Average rent prices in Brighton for Studios, 1 bedroom, and 2 bedrooms are within $100 dollars of Allston, with Brighton being slightly more expensive for 4 bedroom and 5 bedroom apartments. When compared to neighboring suburbs of Cambridge and Brookline, rent prices are considerably lower in Allston. Compared to average rent prices in Cambridge and average rent prices in Brookline, Allston renters can expect to pay about $365 less per month for a 1 bedroom, about $651 less per month for a 2 bedroom apartment, and about $1000 less for a 4 bedroom or 5 bedroom apartment. Allston data shows a much lower average median income and a higher vacancy rate when compared to Brookline and Cambridge. Vacancy rate is 6.4% in Allston, compared to 4.4% in Cambridge, while median household income for Cambridge is $79,416 compared to Allston’s $44,000. These two factors certainly contribute to lower rental prices for Allston. All of this data and more is readily accessible for landlords and renters alike with a live phone staff answering calls from 9am to 9pm Monday through Sunday. Landlords can call at any time to get a snap shot of the rental market for that area, including current prices of apartments in their immediate neighborhood, vacancy rates, and more. Boston Pads uses this data to help local landlords to set the best rental price for their apartments so they can maximize their rental income and keep their units filled year round. It is this data driven approach that has helped Boston Pads build their network to over 16,000 Boston area landlords. Landlords that list with Boston Pads ensure themselves the best marketing coverage from one source. 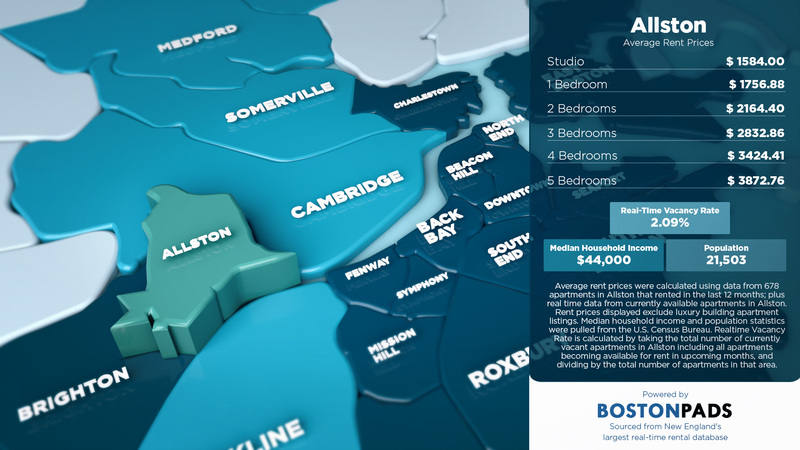 Listings on Boston Pads are syndicated to all the national platforms like Trulia, Craiglist, and Zillow, over 80 locally optimized apartment websites, and 100 local social media pages on Facebook, Twitter and YouTube. For renters, this infographic will give them an accurate snapshot of the rental market in Allston, which will no doubt be of value when searching for apartments in Allston. With a dedicated staff calling on local landlords to update listings 7 days a week, renters can ensure that the listing information found on Allston Pads is the most accurate available. Nowhere else can renters access as many real time listings in Allston, insuring a smooth apartment search with less runaround. 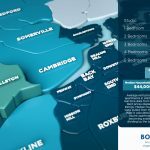 To see the average prices for more towns in the Greater Boston area, check out our infographic on average rent prices in Boston by town.